Fairfield University’s Katherine Schwab talks about her research on ancient Greece's most famous coiffure. Which of the six Caryatids braided her hair the fastest? Did they use tools for hair curling? Normally, research in archaeology does not involve practical research in a hair salon. 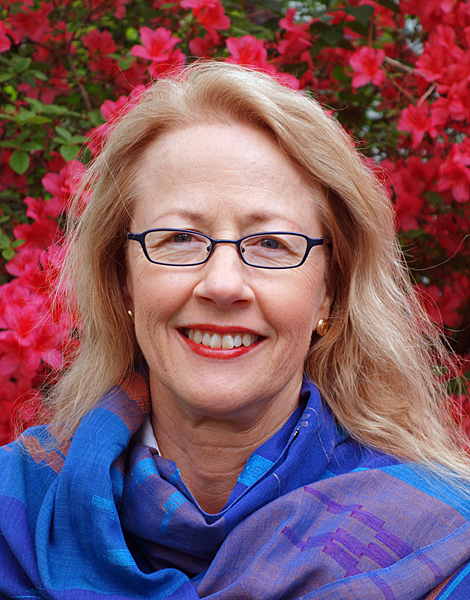 But in the case of Katherine Schwab, expert in Greek and Roman art and archaeology and Professor of Visual and Performing Arts at Fairfield University in Connecticut, it did. Ten years ago, while observing the Caryatids, she noticed something beyond their classical beauty, their graceful poses and their unique characteristics: their hairstyles! “Could we recreate these?” she asked an experienced hair stylist, pointing at photos of the 2,500-year-old marble sculptured fishtail braids on the six famous maidens, who, for centuries stood in place of columns on the south porch of the Erechtheion on the Acropolis. Talking to me now, the professor explains that “this question led to an example of experimental archaeology.” She is referring to “The Caryatid Hairstyling Project,” first presented in 2009 and since then the subject of a documentary film screened at universities, museums, galleries and archaeological film festivals around the world. When was the first time you noticed that the Caryatids have interesting hairstyles? In 2007, Fairfield University hosted the world premiere of the exhibition “The Creative Photograph in Archaeology,” organized by the Benaki Museum in Athens, which included several photographs of the Caryatids. I looked very closely at the photographs by the German photographer Gösta Hellner. The complexity of the braids and even the presence of the braids themselves were surprising, and I realized, too, that no two hairstyles were exactly alike. 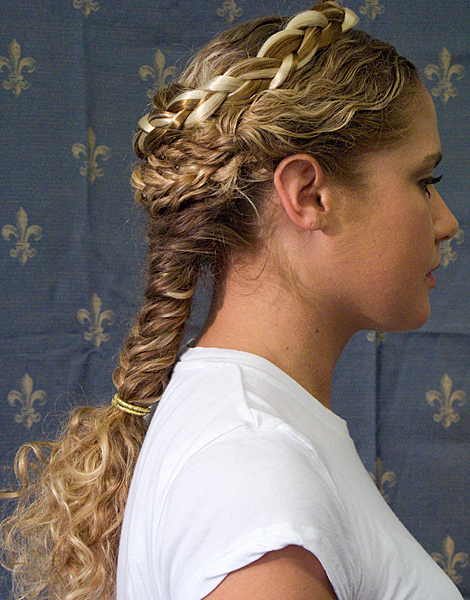 Each Caryatid or Kore did, however, have a thick fishtail braid. Currently, the fishtail is one of the most fashionable braids, and it always makes me wonder if people wearing it today understand its history or know that it is also worn by the Caryatids of the Athenian Acropolis,carved nearly 2,500 years ago. The hairstyles I was looking at were remarkably well-preserved; this is, in part, due to the Erechtheion’s south porch roofing, which afforded protection from the effects of air pollution and general weathering. The photographs by Hellner revealed crisp detail. As I looked at them, I wondered if we could recreate these ancient hairstyles. I contacted Milexy Torres, a very talented and experienced hair stylist in my town. I showed her the photographs and she said she knew exactly what was going on and how these hairstyles were created. In Athens the Archivist at the American School of Classical Studies at Athens (my research affiliation in Greece) brought to my attention a stunning photograph that has to date prior to 1907. The hairstyles of Kore A and Kore B in backview were in excellent condition with exquisite carving still quite visible. What is the most amazing thing you found out about hair in the classical world? Among the most remarkable things we discovered during this project is that hair really has significance. Hair can symbolize rites of passage, personal identity, status, cultural identity and much more. Research on these ancient hairstyles can lead in many directions and result in a wealth of information about the role hair did, and does, play in societies. 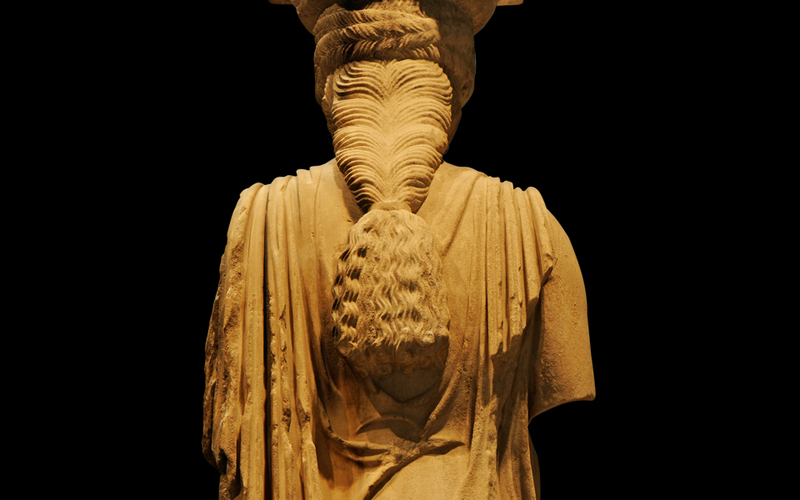 The hairstyles worn by the ancient Caryatids, for instance, are unusual and seem to belong to an earlier tradition. This is probably why they would have been worn only for very special occasions. In part, these hairstyles linked these maidens to past traditions within Athenian society, forming a bridge across time and generations. The entire project revealed how something such as hair can serve as a portal to a time and place that seems remote, and can bring an ancient era to life. Students who have seen the film are consistently surprised and excited by how this vehicle, if you will, can stimulate their curiosity and their desire to learn more about a culture and society. 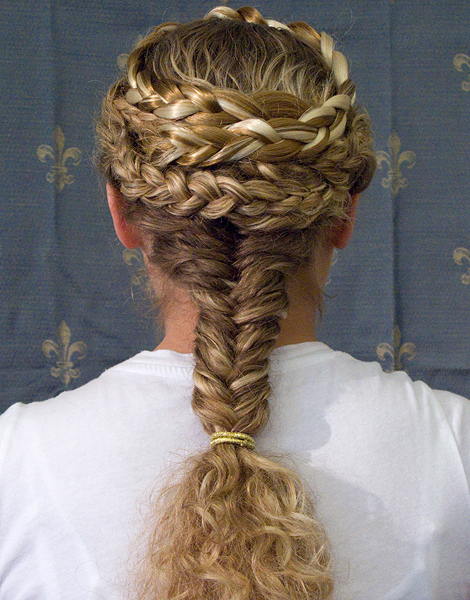 In this case, a unique hairstyle is the springboard, but one can use many other topics as well. Did our Greek ancestors use hair extensions? Such evidence has not been documented, to my knowledge. 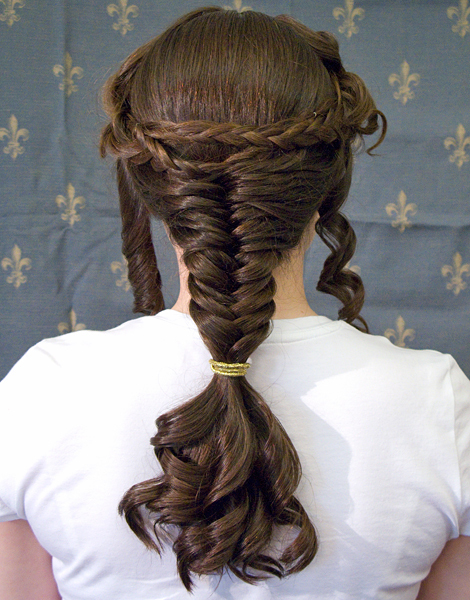 In contrast, extensions or braids have been found in Roman burials. In the case of the Caryatids, we need to keep in mind that the statues themselves are well over life-size and their function as columns supporting the roof requires a thickness at the neck (and therefore at the fishtail braid) to support the capital above their heads and the roof. If we were to scale down the figures to average female height, I think that the amount of hair becomes more understandable and naturally attainable. The Caryatids wear the fishtail braid down the back, two or three corkscrew curls from behind the ear resting on their chests, plus braids that wrap around their head to create a transition from the head to the capital directly above. 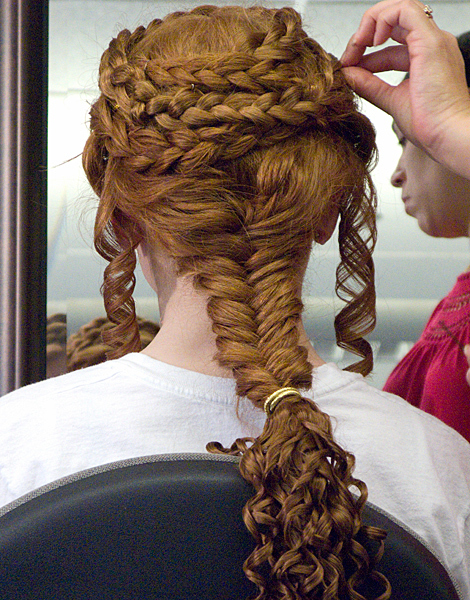 It is this last set of braids that makes us wonder about the use of hair extensions. What about curling, or other tools? Did they dye their hair? Did they shampoo? What did they use and how often? Tools for curling hair – this is usually among the first questions I’m asked when I give lectures on the project. Nearly all representations of females in ancient Greek art show hair with texture, from gentle waves to very curly hair. This kind of hair needs little guidance to form corkscrew curls when still damp after washing. 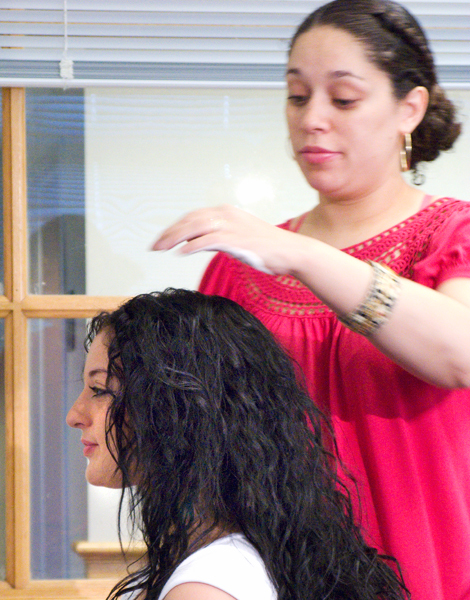 A lock of hair can be wrapped around a simple tool, such as a slender smoothed stick. The stick can be slid out, while the curls stay in a coil lasting up to a few days. This low-tech approach is practical and easy to do, and I’ve learned that it is still used today in many areas of the world. I’m not certain we really know what was used as shampoo, but something like a chamomile tea solution can do the job. Unless we have actual hair to test for chemical residue, I don’t know if we have been able to confirm evidence of hair dyeing. We do know that in ancient Rome, hair dyeing was practiced. To this end, it wouldn’t be surprising if some kind of coloring or tinting was done to the hair in Greece as well, but we really don’t have evidence to support this. How did you find the models? Ι started looking in my classes and in the Art History program. The key elements were length, thickness and, if possible, wavy or curly hair. And I found six students who had the best hair for the project. What kind of difficulties did you face? Styling the hair proved to be really the easiest part, in that Milexy knew just what to do and was ready to do it. An unexpected heat wave, however, did present a challenge, particularly when our six models, with their hair styled, went outside to be filmed in the same arrangement as the original Caryatids. A couple of the students had straighter and heavier hair, which required hairspray to hold the curls in place. Once outside in the high heat, those curls started to disappear. In contrast, the curliest natural hair, belonging to the student model who was Kore C, responded to the heat by making smaller and tighter curls – the length of her fishtail braid kept shortening. The impact of the high heat on these hairstyles, a factor which we could not control, proved to be a good approximation of what might have been faced in Athens during the summertime in antiquity when maidens would have participated in outdoor religious festivals. I timed how long it took to style each model – the fastest, about 40 minutes, was for the student who was Kore B. Her hair was an ideal texture for the hairstyle, especially the fishtail braid. The models with straighter heavy hair required more time and applications of hairspray, and this lasted about 1½ hours per model. You have also developed a new method of recording your observations of the east and north metopes of the Parthenon. Are you continuing your research in Athens? I visit Athens every year, as I continue to work on drawings in the Acropolis Museum. Grayscale scans of my metope drawings are part of the installation in the Parthenon Gallery and to have them included is a great privilege for which I am very thankful. You can see them on the frames holding the east and the north metopes. My hope is that the drawings bring attention to the metopes which were originally highly visible in antiquity. The scans of my drawings, combined with the original metopes, engage the museum visitor in considering the original composition and what has been lost. Thanks to Professor Pantermalis, President of the Acropolis Museum, it’s possible for me to draw in the Parthenon Gallery for many hours each day during my research trips to Athens. Sometimes visitors come over and talk to me to ask what I’m working on and they become quite curious about the Parthenon’s sculptural program and the research conducted by archaeologists. They’re often rather surprised that research on the Parthenon never stops!